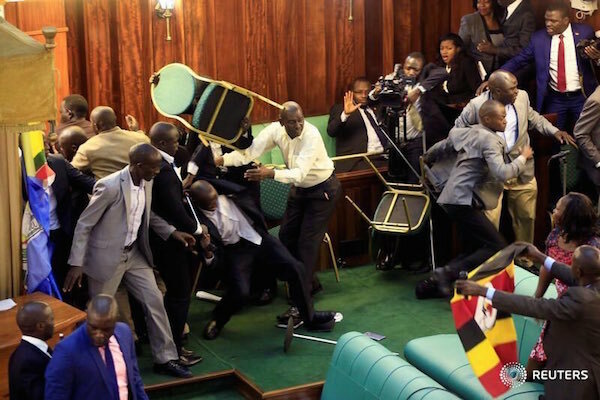 Lawmakers brawled in Uganda’s parliament for a second day running on Wednesday over a fiercely disputed move to change the constitution to let long-ruling President Yoweri Museveni run for re-election after age 75. The motion passed, parliament communications director Chris Obore told Reuters, adding that Magyezi would have about a month to submit the bill to a first reading in the House. The proposal, echoing steps by other veteran African leaders to void legal limits on their rule, has stirred widespread resistance from rights activists, opposition parties, religious leaders and even some members of Museveni’s party. 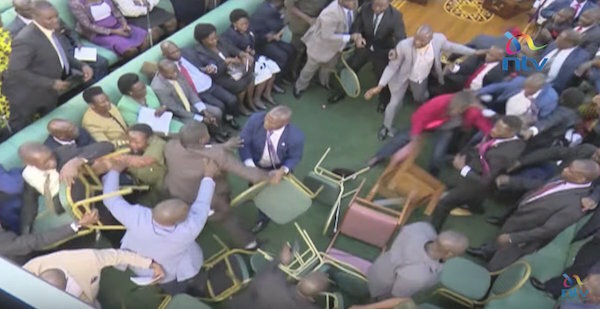 Fisticuffs first broke out in the Kampala parliament on Tuesday, leading Uganda’s communication regulator to ban live broadcasts of events “inciting the public”. No station aired Wednesday’s proceedings, but some posted clips of the brawls on their Twitter feeds. 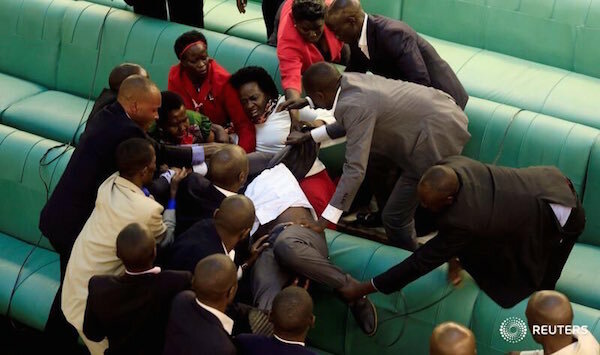 Uganda’s two major privately owned TV stations, including a local unit of Kenya’s Nation Media Group, and some radio stations carried Tuesday’s parliamentary session live. Critics said the authorities’ action to ban live broadcasts underscored a crackdown on anyone questioning the planned constitutional amendment. Since last week, when a motion to kick-start the amendment process was supposed to be read but never made it to the floor, both police and military personnel have been deployed around the parliament and many parts of the capital. Protests by students and opposition activists and supporters in Kampala against the amendment, sometimes broadcast live, have been put down with tear gas and arrests of scores of people. On Tuesday, anti-government protests also occurred in other parts of the country, including in the northern town of Lira. Three local journalists there were arrested as they covered the protests, according to Hudson Apunyo, an official in a journalists’ association in the area. Robert Ssempala, national coordinator for Human Rights Network for Journalists-Uganda, said banning live broadcasts was “to shut out Ugandans and keep them in the dark on the age limit debate” after the measure met broad resistance.